Click at the frontimage to see a sample from EMBROIDERY STITCHES. Please be aware that interactivity is limited on this trial version. 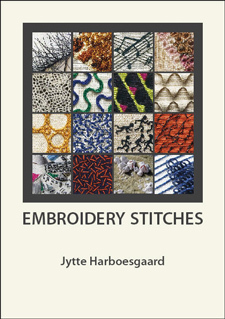 EMBROIDERY STITCHES is the English edition of a slightly revised republication of the Danish Broderisting, which was published by Borgens Forlag in 1980. The original Danish edition has been sold out for several years from the publishers and after many requests, it is now being re-issued as an e-book in both the Danish and English languages. EMBROIDERY STITCHES has 190 pages and in all, 180 embroidery stitches, which are explained by the aid of descriptions and diagrams. Canvas embroidery techniques are not included in the book. EMBROIDERY STITCHES contains a register of stitches accompanied by photographs. The stitches are embroidered with coloured threads in order to emphasise the technique. This interactive register and an alphabetical index make it easy to become acquainted with the contents of the book. EMBROIDERY STITCHES is an encyclopaedia of stitches and it will appeal to all those who are involved with embroidery: to teachers in schools and colleges, to schools of handcraft, and to schools of further education. It will be useful to teachers of young children and youths, and will aid therapists. In addition, it will of course appeal to those who simply enjoy embroidery. All my life, I have been involved with embroidery, partly as a teacher at the Danish college, Håndarbejdets Fremmes Seminarium for over 20 years and partly as an instructor of numerous courses in embroidery, both at home and abroad. This made me realise that there was a crucial lack of an up-to-date encyclopaedia of embroidery stitches; an encyclopaedia where information can be sought about the many embroidery stitches that are an essential foundation to develop embroidery skills above the most elementary. At first glance, 180 embroidery stitches can appear a little daunting, but each stitch has its own characteristics and by taking one step at a time, either systematically or randomly, the stitches gradually pave the way to new inspirations, that are much needed in the world of embroidery. I have worked for many years with experimental embroidery, the result of which can be seen in the books "Embroidery Mail - Book of Days" and "Kunsten at Brodere."